They say that the potential health benefits of oats are numerous and include lowering cholesterol, helping to improve blood pressure and lowering the risk of diabetes, amongst other things. Oats are also inexpensive and a great option for delivering delicious fuel to your body. Most of us get caught up in eating oats either in the form of oatmeal or granola; which can easily get boring. In her new book Oatrageous Oatmeals author Kathy Hester provides delicious and creative alternatives to eating oats. Recipes include sweet options like, Banana Oatmeal Cookie Pancakes, Chai-Spiced Oat Shakes and Blackberry Mojito Overnight Refrigerator Oats. Along with savory recipes like Mushroom Sun-Dried Tomato Steel-Cut Oat Risotto, Oats-bury Steaks, Not-from-a-Box Mac and Oat Chez and even healthy vegan sausage crumble made from steel-cut oats and spices. Once the soaking time is up, remove the cinnamon sticks and pour the mixture into a blender. Blend for 1 to 2 minutes or until most of the particles have broken down. agave, and vanilla and blend well. This looks amazing! I've got to try, I don't eat enough oats. This is such a great book - and this recipe has been on my "to-make" list since I first saw it, thanks for the reminder! I go in phases where I eat my oats plain and sometimes add them to my smoothies! Love the idea of changing up the flavors! I've mainly had my oatmeal plain--cooked on stove top, add a little milk and maybe a drizzle of honey. I also use rolled oats in my meatloaf. This looks delicious! Love using oats in different ways! I normally eat oat like oatmeal or in granola bars! I love the Oat Chata and giveaway! Healthy and delicious - love this recipe! Oats are so good for you, what a great drink to use them in! Very interesting and super unique! Healthy oatmeal cookies. But very interested in the savory recipes in this cookbook. Plan to experiment with oatmeal as an alternative to rice for vegetarian cookies. I love oats in cookies and as a topping on apple crisp! Lately I've been enjoying them with lots of raspberries, cinnamon, and soy milk...yum! I'm totally guilty of only eating oats in either oatmeal or oatmeal cookies! I would love to add more oats into my life. I actually made Kathy's drink before and its delish! Who knew! Oh please pass the pitcher, I need a tall glass! Look like a drink that will stick with you all morning! I had no idea you could make a drink out of oats! Oat-chata sounds just great. I already have Kathy's cookbook and I agree that it is great! I was first introduced to a smoothie with oats about a year ago and was surprised at how much I liked it! This looks like something I need to try. Sounds interesting! I've never tried this, will have to give it a go. Looks pretty awesome Ill have to try! This is really cool. I love the overnight soaking and using both grains, really interesting and I'm sure it's delicious!!! Thanks for sharing with us! 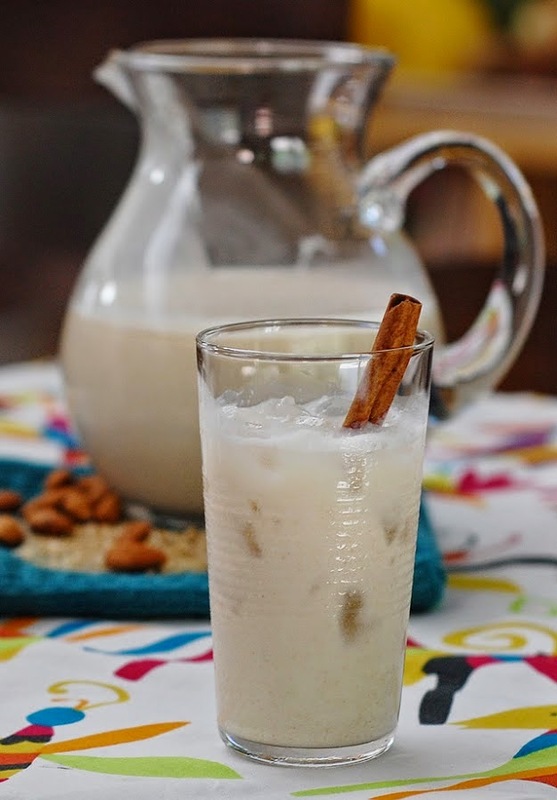 Love horchata... adding oats sounds wonderful! I can imagine how well those flavors go together. I eat my oats with cream and sugar and sometimes with raisins.